Two Cowley College-Mulvane Campus students were named to the 2016-2017 All Kansas Academic Team and were honored in Topeka on Thursday, February 16. The event, sponsored by Phi Theta Kappa International Honor Society, the Kansas Association of Community College Trustees (KACCT), and the Kansas Council of Community College Presidents, serves to recognize top students from the state’s community colleges. Scholars recognized from this event included Courtney Anderson and Abigail Graham, members of Beta Phi Upsilon chapter of Phi Theta Kappa on the Mulvane campus. While in Topeka, Anderson and Graham were able to tour the capital building and meet with the wife of their district’s house representative, Mrs. Karen DeGraaf of Mulvane, KS. Additionally, Courtney Anderson was among the 10 students honored on the floor during the 11 a.m. house legislative session by Representative Richard Proehl of Labette, KS. At the luncheon, Anderson and Graham were able to have lunch with and speak to Mrs. DeGraaf about their future plans and their experiences in community college. The keynote speaker was Reverend Dr. Jamie Washington, who spoke about engagement and that if you can leave things better than you found them, your time will not be in vain. He encouraged those in attendance to be active participants in their lives and to commit to specific goals each day of the week to better themselves as leaders in society. 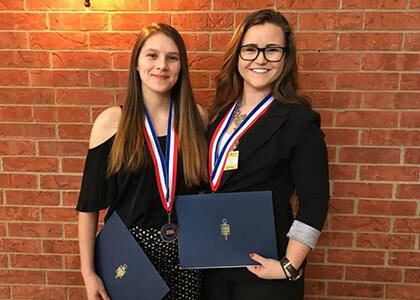 Each scholar received a $300 educational scholarship, a medallion commemorating their membership in the All-Kansas Academic Team and a certificate signed by Governor Sam Brownback. In addition, each scholar is awarded a minimum of $1,000 transfer scholarship if they transfer to any of the Kansas Board of Regents Universities, Washburn University, or a Kansas independent college. Anderson and Graham are now nominated for the All-USA Team, sponsored by Phi Theta Kappa and the American Association of Community College. Qualifying team members receive an additional $2,500 stipend and will be featured in USA Today. Courtney Anderson of Derby, KS is a Chemical Engineering Major who plans to transfer to Kansas State University. She is a member of Phi Theta Kappa, the chair of the Honors in Action Committee, a member of Mu Alpha Theta, and was named to the Dean’s list. Additionally, Anderson works in the summers for KDOT helping maintain and clean highways. Anderson hopes to become a Petroleum Engineer after completing her degree. Abigail Graham of Wichita, KS is an Anthropology Major who plans to transfer to Kansas State University. She hopes to complete her degree in Anthropology and participate in archeological digs as history is fascinating to her. Beta Phi Upsilon would like to express how proud the chapter is of these two scholars.